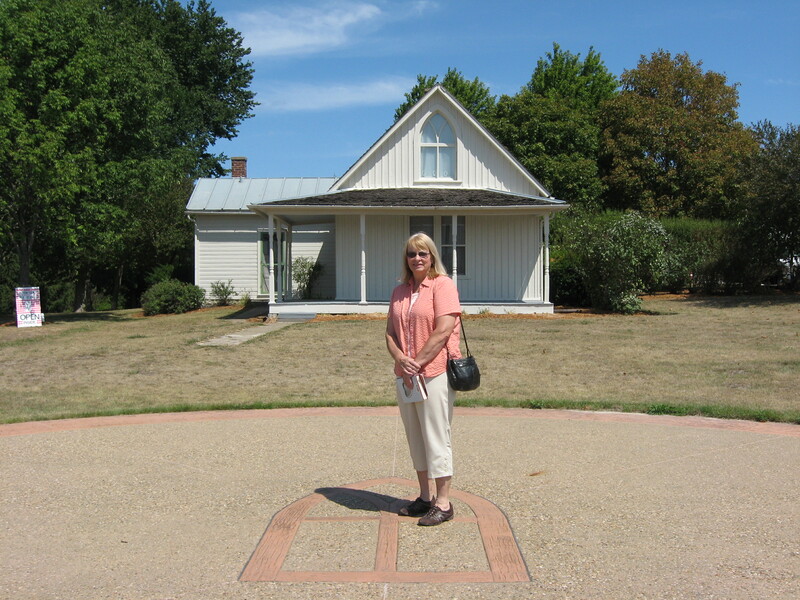 The American Gothic House in Eldon, Iowa. The business is open summer weekends. 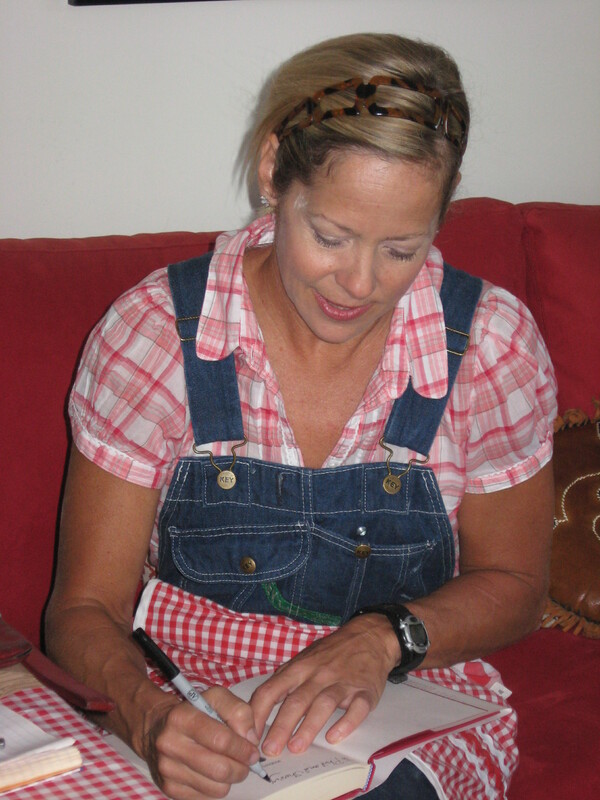 Beth M. Howard autographs her memoir. The trip to Eldon was Sherry’s idea. The mention of pie made Phil a willing participant. 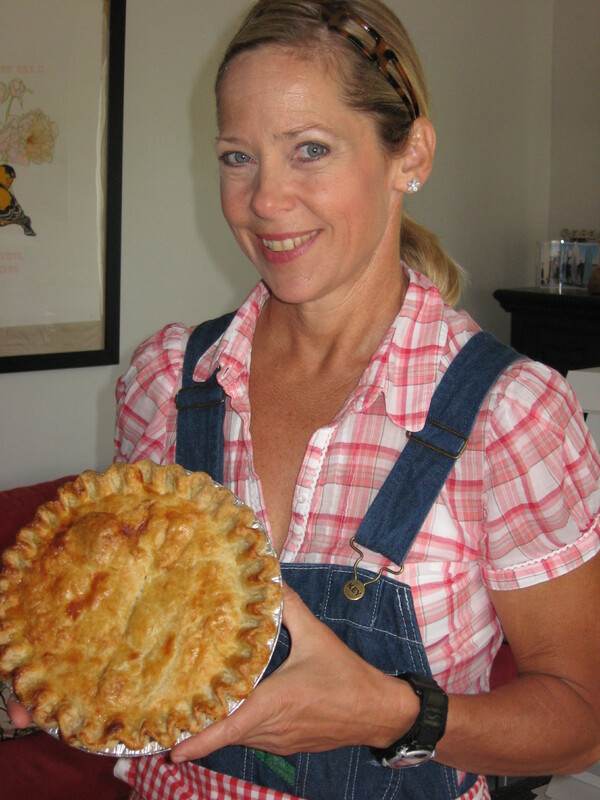 Beth M. Howard, a survivor who bakes wonderful pies. With very few exceptions, I love pie. And I love to travel. 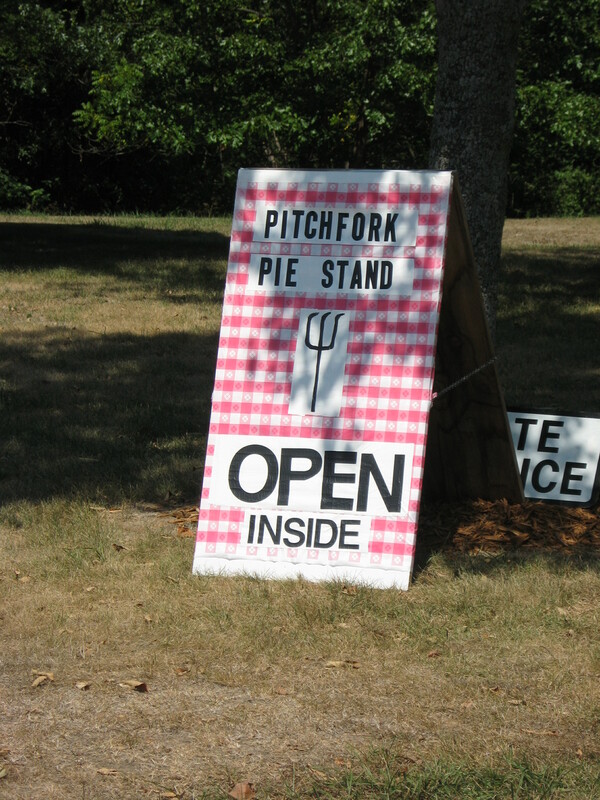 So when my wife Sherry recently suggested we devote part of our Saturday to a road trip to Eldon, Iowa, to visit Pitchfork Pie Stand, I was ready to go. Eldon is a pleasant little community but, frankly, not Iowa’s most exciting city. Before the pie lady, Beth M. Howard, moved to town, bringing renewed publicity to the place, Eldon’s main claim to fame was the American Gothic House and its church-like, second-floor window beneath the roof peak. It served as the backdrop for artist Grant Wood’s famous painting of a man in overalls holding a pitchfork and a woman wearing an apron. 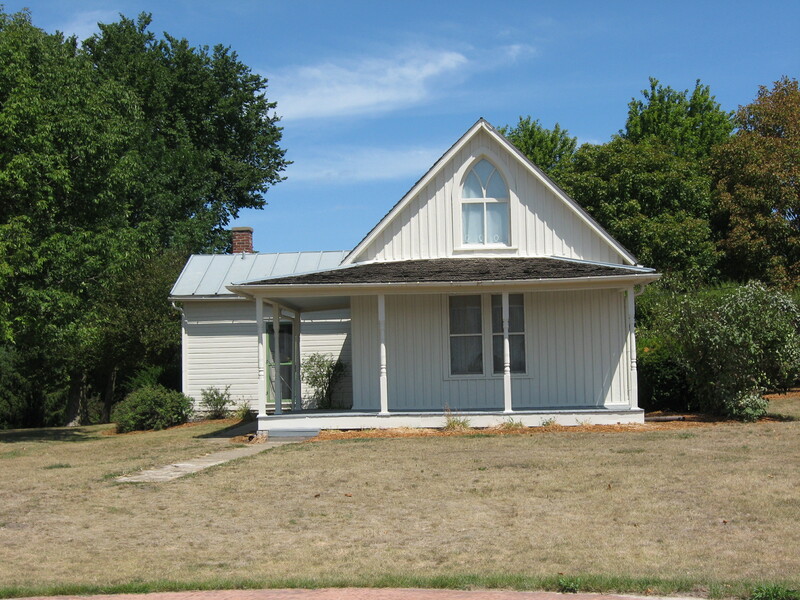 We’d seen the State Historical Society of Iowa-owned American Gothic House in the past. So the main attraction for us was Howard, who lives in the house and sells homemade pies there at her Pitchfork Pie Stand. I’d read a newspaper review of Howard’s 2012 Harlequin-published memoir, “Making Piece: A Memoir of Love, Loss and Pie.” Sherry had read a profile of Howard in the August 2012 issue of Guideposts and had bought her book and started to read it. Howard is a survivor who has a remarkable story to tell. Though she is a graduate of Davenport Assumption High School, she was born in Ottumwa and spent her early years there. In 2001, while living on the West Coast, Howard quit her web-producing job to bake pies at a gourmet deli in Malibu. TV and movie stars were among her customers. She started her popular blog, theworldneedsmorepie.com, in 2007. In 2009, Howard was living in Texas when she filed for divorce from Marcus, her 43-year-old husband of six years. But just hours before he was due to sign the divorce papers, he died suddenly and unexpectedly of a ruptured aorta. Grief and guilt from the sudden loss gripped Howard, and she thought she’d be unable to go on. But writing about her grief helped. So did a pie-related trip around the country in the couple’s RV, where she interviewed pie bakers, visited fruit orchards and spread the word about pie. “I found that pie was this amazing connecting force between people,” Howard said in a Huffington Post article. 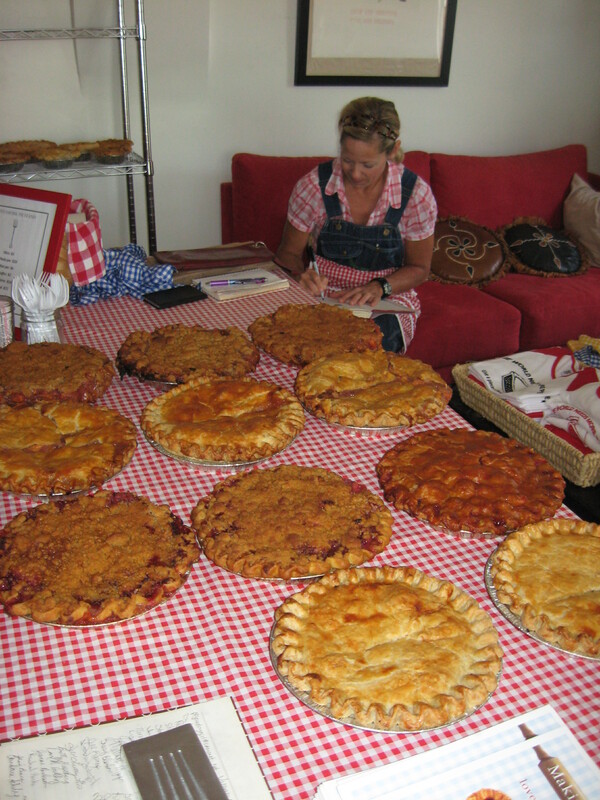 In the summer of 2010, a year after Marcus’ death, Beth Howard returned to her native Iowa to, quite appropriately, judge pies at the Iowa State Fair. Though her parents no longer lived in Ottumwa, she drove there after the fair and looked up the house she grew up in, her old grade school and her dad’s office building. 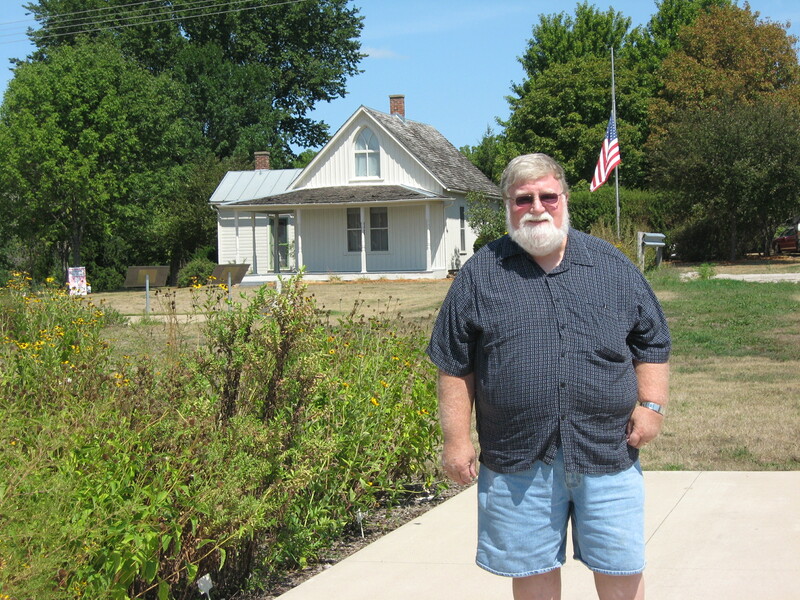 Later, while driving east on Highway 34, Howard saw a sign for the American Gothic House in Eldon and drove there to see it. When she learned the house was for rent and had been vacant for two years, the wheels started turning. Two weeks later Howard was moving in, and Pitchfork Pie Stand was conceived. Now, starting Thursdays, Howard bakes up to 100 pies. She sells them from noon to 5 Saturdays and Sundays from summer through Labor Day at the famous house. The large (9 inch) pies are $20, mini pies are $6 and slices go for $3. Business was steady during our visit. One couple said they’d driven six hours to get there. As Howard placed our purchases in individual white boxes adorned with red, yellow or blue checkerboard ribbons, I asked her if Iowa’s hot summer had caused her to regret her move here. “I’m still very happy here,” she said. Howard, who said she is familiar with North Scott Press, is a journalist. “But I don’t have time to write anything anymore,” she lamented. That’s because in addition to baking and selling pies, she also does “book events” all over the country that include readings and pie-making demonstrations and classes. She also makes regular appearances on national TV shows. During our visit, the pie flavors available for sale were shaker lemon, peach, peach crumble, strawberry and strawberry crumble. Some apple pies were still in the oven. Howard is a what-you-see-is-what-you-get sort of person. So don’t be surprised if she utters some colorful language when you stop in. A few days prior to our visit to Pitchfork Pie Stand, Larry the Cable Guy and his camera crew had stopped in to shoot a future episode of his “Only in America” TV show on the History Channel. “Did he install cable for you,” I jokingly asked Howard. But she does have pie, and it’s delicious. Copyright 2012 by Phil Roberts, Creative Enterprises. Submitted as an “Everyday People” column to North Scott Press. 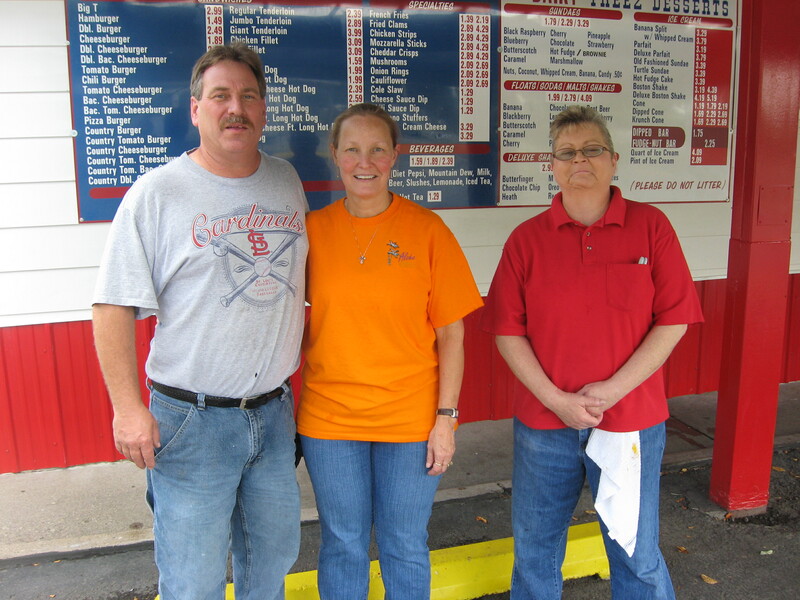 Shown left to right are Alan and Margaret Carter and Tara Kirschenmann. All photos by Phil Roberts. New paint has dressed up the exterior. This message is good news to many. Lots to enjoy for ice cream lovers. 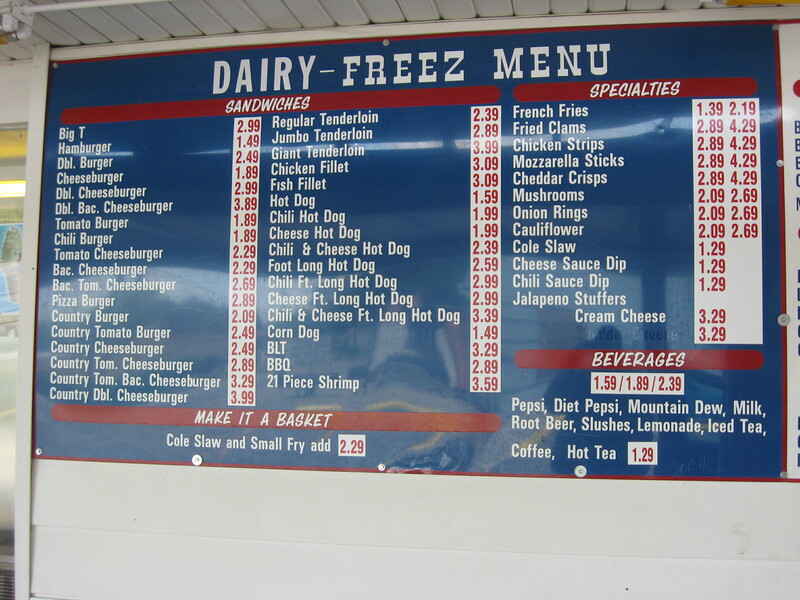 I whined when Tara Kirschenmann of Moline decided not to reopen the Davenport Tastee Freez, which she had owned for about three decades. I missed the landmark fast food/ice cream shop at 3950 Rockingham Road. But now there’s reason to celebrate. 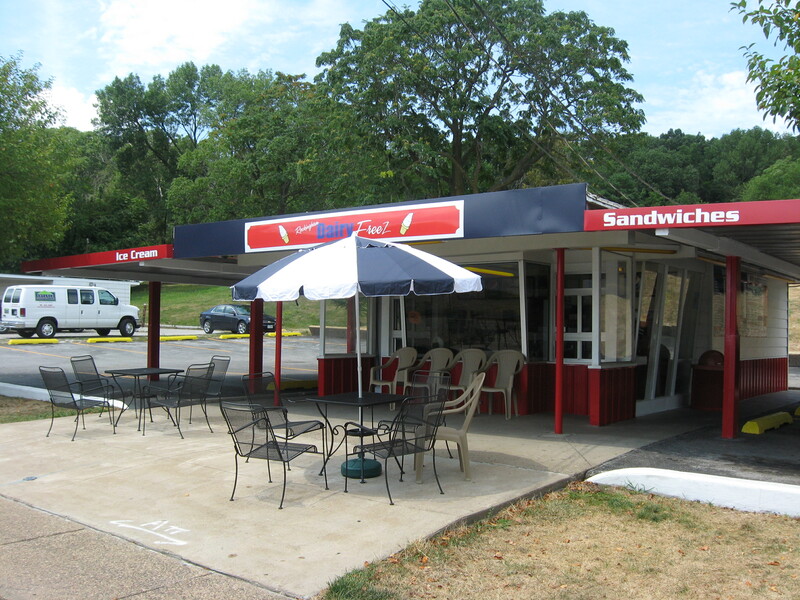 The little place, which was the last remaining Tastee Freez in Iowa, has reopened with new owners and a new name, Rockingham Dairy Freez. Margaret and Alan Carter, who grew up in the neighborhood, bought the place in early June and opened for business in July after making improvements inside and out. 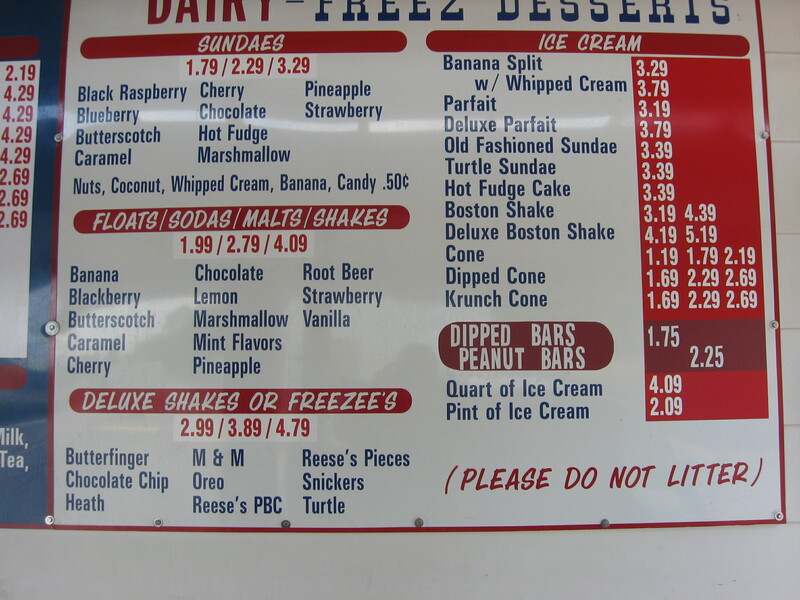 I stopped in recently to meet the new owners and order my favorite snack from the place, a large order of fried mushrooms with buttermilk dressing for dipping and a small chocolate soda, all for $5.01. “How’s business?” I asked Alan Carter. I love the ambiance of the place. And I love the memories it brings back. It takes me back to my childhood and to more recent times when my wife and I were young parents and stopped there with our children. For others, I’m sure the large menu and reasonable prices are a draw. The ice cream offering has expanded, too. Rockingham Dairy Freez has another reminder of the past. Former owner Tara Kirschenmann is working behind the counter for the Carters. She said she’s glad the Carters bought the place and glad it’s open again. “I think they’re doing a great job,” she said. 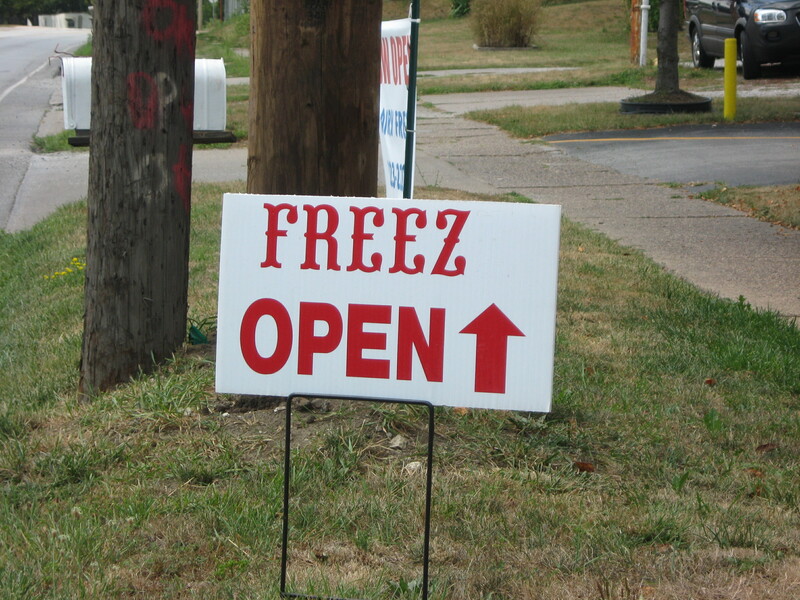 Rockingham Dairy Freez is open 11 a.m. to 10 p.m. seven days a week. Copyright 2012 by Phil Roberts, Creative Enterprises. This was submitted as a column to North Scott Press.